How many among us pay extra for insurance when renting a car? Automobile rental companies such as Hertz, Avis, Alamo, National, Payless, Thrifty and Budget clearly offer this option in their rental contracts. Driving an unfamiliar car certainly increases the likelihood of a mishap. Yet there is a rationale that tells us to opt out. Since losses incurred will be paid by our own insurance companies, minus the deductible, many of us choose to decline the additional coverage. What’s the worst that can happen? Even if you wreck the car, you’re only out your deductible, right? Well, six months from now you could be asking yourself, “What is this $7,500.00 bill I just received from Hertz that seeks reimbursement for diminished value?” Next you’ll wonder “do I have to pay it?” Then, after making calls to Hertz and your insurance company, the grim reality sets in…..you are liable because losses for automobile diminished value aren’t covered in your insurance policy. What is automobile diminished value? This LINK will bring you to a boatload of information on the subject. For those of us with less time on our hands, this Q&A site answers questions that people most commonly ask. Diminished value, in essence, means that a car that was previously repaired after a collision is worth less than a similar car that had never been in a wreck. In most states, your own insurance does not cover this. You can make a claim for diminished value, but only if the accident was someone else’s fault. The liability portion of all insurance policies guarantees to make injured parties whole and that includes diminished value. You can expect to be bombarded by requests for payment, contacted by debt collectors and even hauled into civil court if you don’t reimburse them. Ignorance of the law, as they say, isn’t a valid defense. You can’t plead innocence even though less than one in a hundred people in the USA even know what diminished value is. And of those who are familiar with the concept, how many realize that it also applies to rental cars? So what to do when faced with this situation? Liability has already been established – you owe money to the rental company. But is their estimation of $7,500.00 correct? How did they arrive at that figure? One of the things you will learn is that diminished value is very subjective. Insurance companies, who are most often the ones on the hook for these claims, like to pretend that cars don’t lose that much in value after being repaired – that a bad Carfax hardly affects the car’s worth to a dealer or potential used car buyer. They typically hire an independent appraiser who will write a low-ball diminished value report usually with no actual evidence to back it up. Their aim, since they are paying, is to reduce the amount of that payment. Car rental companies, on the other hand, are not the payers but rather, they are the payees. So what is to prevent them from inflating the amount of diminished value to whatever arbitrary number they want? It is a certainty that, if there are mercenary appraisers who will write low-ball reports for insurance companies, there must also be others that will write inflated ones as well. It all depends on who the client is and what their objectives are. In the case of the diminished value of rental cars, the objective is to squeeze you for every nickel. There are recourses available although they might seem insignificant. 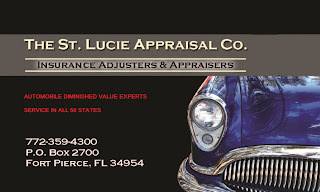 You can hire an independent appraiser such as The St. Lucie Appraisal Company to prepare a tax-deductible diminished value report. Our report may reveal that the diminished value of the subject vehicle might not be anywhere near the $7,500.00 they are seeking. And speaking of taxes, a portion of the diminished value payment can be deducted as well – usually about 20% of the total amount. An appraiser’s qualifications are important. An independent appraiser who is licensed in any state holds a powerful credential. You will also find what are known as “certified” appraisers who pay a yearly fee to maintain that credential as well as appraisers with no credentials whatsoever. Make certain that your appraiser uses a credible methodology for determining the amount of diminished value. Appraisers who simply provide opinions based on “years of experience” or use formulas or algorithms should be avoided as their reports tend to fare poorly in court and in arbitration. Anyone dealing with automobile diminished value is going through a learning experience that, hopefully, they will pass along to others. There are insurance companies wanting to pay less and car rental companies wanting to be paid more. In the middle we stand, taking fire from both sides. But diminished value is real. The car is worth less. The question is, how much less?